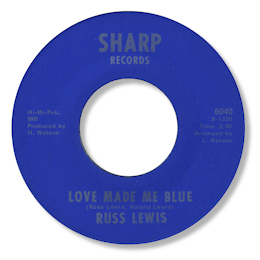 I’m pretty sure this is the only 45 that Russ Lewis had issued – but Love Made Me Blue is a strong piece of Chicago soul. The tune has some nice bluesy chord changes and the musicians, especially the horns, are as tight as anybody could wish. Fine trumpet solo too. Lewis acquits himself well on the downbeat lyric – those little howls towards the conclusion sound just great! Pounding flip isn’t bad either. Thanks to Davie Gordon for giving me the correct location for this 45.